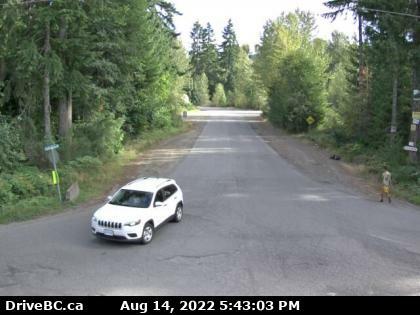 Highways 17, 1, 19, 14, 4, 18 Head Bay Rd - Sidney, Victoria, Malahat, Sooke, Nanaimo, Ladysmith, Campbell River, Port Alberni..
Highway 4 - Highway 4's eastern terminus is at an intersection with Highway 19A in Qualicum Beach, where the highway is known as Memorial Avenue. The highway starts off travelling due south for 2 km (1¼ mi) to an interchange with Highway 19. Another 2 km (1¼ mi) south of the interchange with Highway 19, Highway 4 meets a junction with an older Alberni Highway segment, now known as Highway 4A, at the small community of Coombs. Highway 4 veers directly west upon meeting this junction. West of Coombs, Highway 4 travels for 11 km (7 mi) before meeting Cameron Lake. After Highway 4 leaves Cameron Lake, it begins to wind its way through MacMillan Provincial Park, which includes the well-known area of Cathedral Grove. 20 km (12 mi) west of Cameron Lake, Highway 4 reaches a spur that travels into the city centre of Port Alberni. Highway 4 actually goes through land belonging to the city of Port Alberni starting 2 km (1¼ mi) west of the main spur into the city and lasting 5 km (3 mi), after which Highway 4 finally leaves Port Alberni via a bridge over the Somass River. 4 mi west of the Somass River crossing, Highway 4 reaches the shore of Sproat Lake, following the lake shore west for 24 km (15 mi). Highway 4 goes through Sutton Pass another 10 km (6 mi) later and turns toward the south-southwest. This very winding bearing of Highway 4, which features very steep grades, continues for 23 km (14 mi) before reaching the southeast shore of Kennedy Lake. Highway 4 then follows the shore of Kennedy Lake southwest for 19 km (12 mi), then reaches a junction with a spur into the settlement of Ucluelet 5 km (3 mi) later. At the Ucluelet junction, Highway 4 then makes a ninety-degree turn towards the northwest. 1 km (0.6 mi) later, Highway 4 enters the Long Beach arm of Pacific Rim National Park. Highway 4 goes through the national park for 22 km (14 mi) northwest, finally terminating 11 km (7 mi) later at Tofino. Highway 14 - The total length of Highway 14 is 103 km (64 mi). In the east, Highway 14 begins at a junction with the Trans-Canada Highway in north Langford, proceeding south for 3 km (2 mi) as the Veteran's Memorial Parkway through the community of Langford before turning west and continuing through Langford and Metchosin for 22 km (14 mi), also passing by a local hill known as Mount Helmcken, before entering the city of Sooke. 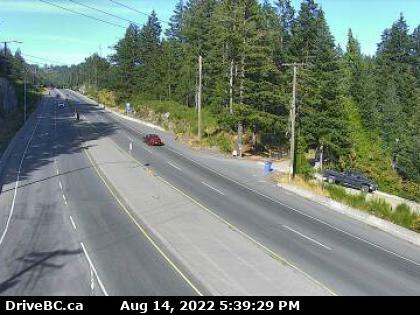 After Sooke, Highway 14 proceeds west for 36 km (22 mi) to Jordan River, hugging the coastline for most of the distance. Highway 14 then travels west northwest along the southwestern coast of the Island for 42 km (26 mi), finally terminating at a Federal Government marine dock in the town of Port Renfrew. Highway 17 - In the south, Highway 17 begins at the intersection of Belleville and Oswego streets one block to the west of the provincial parliament/legislature buildings. From Douglas and Blanshard, The highway travels north for 3 km (19 mi) through the city of Victoria before leaving the city at Tolmie Avenue; 2 km (1¼ mi) north of Tolmie Avenue, Highway 17 turns into a 6 km-long freeway (4 mi), with three interchanges. After the third interchange at Royal Oak Drive, Highway 17 turns into a regular divided four-lane arterial, and goes for 14 km (9 mi) through mostly farmland, until it reaches the town of Sidney. After exiting Sidney 3 km (2 mi) later, the Pat Bay once again becomes a freeway, with two more interchanges along its length, toward its northern terminus at the Swartz Bay ferry terminal another 3 km north (2 mi). 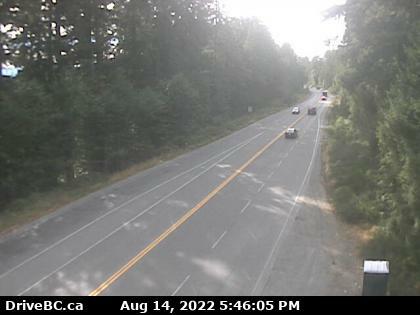 Highway 18 is a short, 42 km (26 mi) long main vehicle route on Vancouver Island, connecting the city of Duncan on the Trans-Canada Highway with the community of Youbou, on the north shore of Lake Cowichan. Highway 19's northern end is at an intersection with Market Street in the small community of Port Hardy. The highway then proceeds in a southwest arc through the town centre, then goes southeast through a junction with the B.C. Ferry terminal at Bear Cove, and a junction with Port McNeill. The highway then winds its way past Nimpkish Lake, then through a 163 km (101 mi) long stretch of dense forest terrain, through the community of Woss and a junction with Sayward, finally entering the city of Campbell River at a junction with Highways 28 and 19A, just past the river that the city is named for. 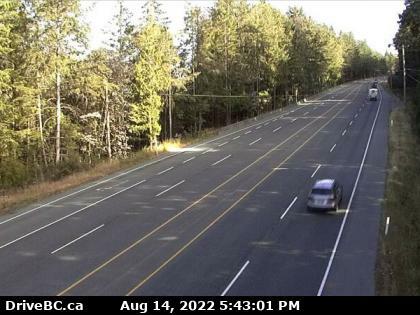 The entire stretch of Highway 19 north of Campbell River is an undivided two-lane configuration. Once at the junction with Highways 28 and 19A, Highway 19 separates into an expressway configuration, built between 1996 and 2001. In Campbell River, the expressway shares its northbound lanes with Tamarac Street, and its southbound lanes with Willow Street. The entire stretch of Highway 19 between Campbell River and the city of Parksville is a divided four-lane freeway or expressway (alternates), with a nominal speed limit of 110 km/h (68 mph), and is referred to as the "Inland Island Highway". South from Campbell River, Highway 19 reaches its first interchange, with a four-lane arterial highway that goes west to the village of Cumberland and east to the communities of Courtenay and Comox. Past the Courtenay Interchange, Highway 19 is divided by a grass median. 16 km (10 mi) later, Highway 19 reaches another interchange, this time with a two-lane road that goes a short distance east to the B.C. Ferry terminal at Buckley Bay. There are two more at-grade intersections on Highway 19 in the 41 km (25 mi) between the Buckley Bay Interchange and the interchange with Highway 4, which goes east into Qualicum Beach. 9 km (6 mi) later, Highway 19 goes through another interchange, this time with Highway 4A, which goes east into Parksville. The next interchange, at Craig's Crossing, is another 5 km south (3 mi). Past the Craig's Crossing Interchange, Highway 19 passes southeast through the communities of Nanoose Bay and Lantzville before finally entering the north part of Nanaimo. 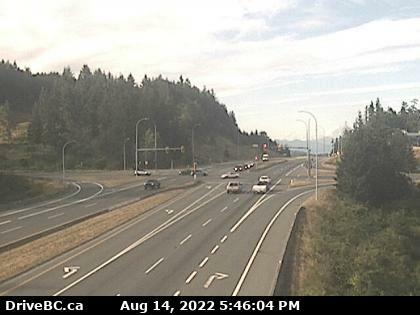 Highway 19 then veers south onto a new 20 km (12 mi) long four-lane expressway known as the "Nanaimo Parkway", which has five at-grade intersections along its length. 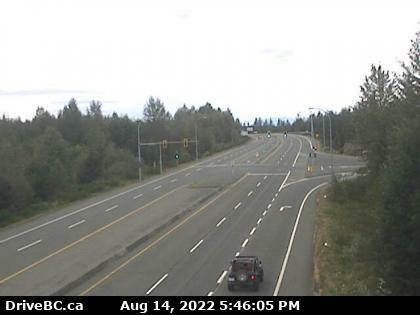 Highway 19's Nanaimo Parkway portion ends at an interchange with the Trans Canada and Cedar Road. At the interchange with Cedar Road, Highway 19 proceeds to share an alignment with the Trans-Canada Highway south for 2 km (1¼ mi) before turning eastward at another interchange . 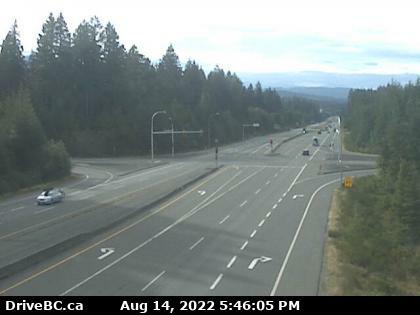 Highway 19 then crosses over the Nanaimo River 2 km (1¼ mi) later, passes through an interchange at Maughan Rd and then goes northward for 5 km (3 mi), finally terminating at the B.C. Ferry terminal at Duke Point. Highway 4 - Sutton Pass cam on Hwy 4 at the Sutton Pass summit looking to the west towards Tofino. Hwy 18, approx. 10 km west of Hwy 1, looking west.